When a circuit breaker is tripped or manually operated, the circuit breaker interrupts the flow of electrical energy by separating its contacts. The flow of electrical energy in a circuit breaker is controlled by a contact assembly. When a circuit breaker is tripped or manually operated, the circuit breaker interrupts the flow of electrical energy by separating its contacts. As the contacts open a live circuit, current continues to flow for a short time by jumping the air space between the contacts in the form of an arc. When the contacts open far enough the arc is extinguished and the current flow stops. Many circuit breakers use a straight-through contact arrangement where stationary and moving contacts are made in a straight line. During a fault, the contacts are opened by the mechanical operation of the circuit breaker spring. Circuit breaker straight-through contact design. Photo: Siemens. 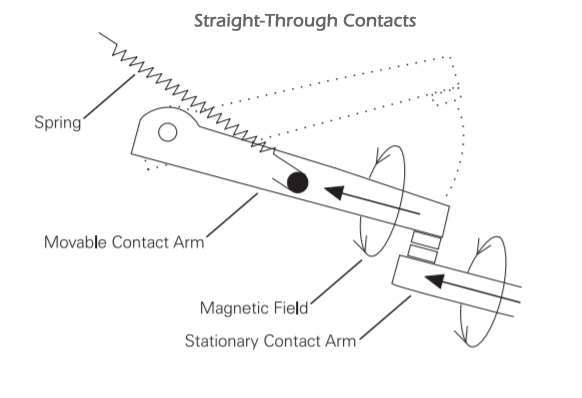 The magnetic fields developed around the contact arms of a straight-through contact arrangement have little or no effect on the contacts arms. If the circuit breaker operates to slow, the resulting arc can cause burning on the contacts. When a fault develops, current through circuit breaker increases rapidly causing the magnetic fields surrounding the contacts to increase. The blow-apart contact design helps to open the contacts faster than the straight-through arrangement by taking advantage of these forces. With the blow-apart design, the two contact arms are positioned in parallel. As current flows in the circuit breaker, one arm is opposite in direction to the current flow in the other arm and the two magnetic fields oppose each other. 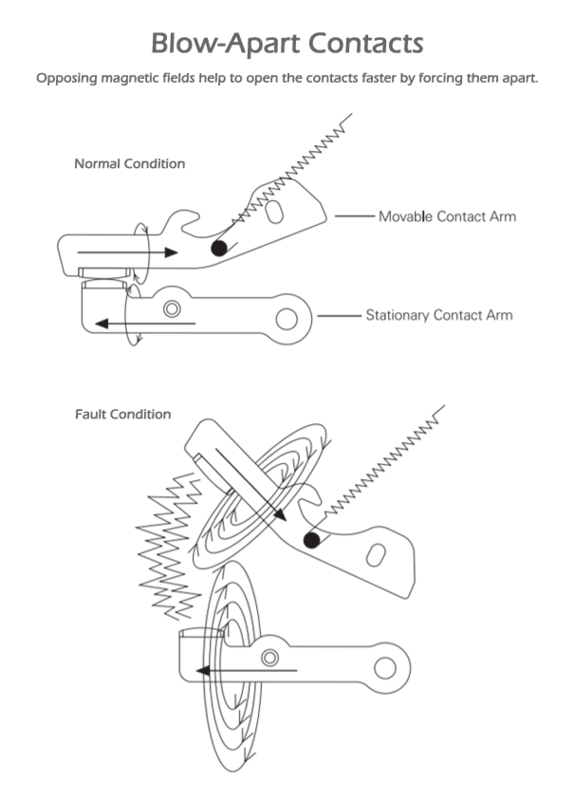 Circuit breaker blow-apart contact design. Photo: Siemens. When a fault develops, current increases rapidly causing the strength of the magnetic fields surrounding the contacts to increase as well. The increased strength of the opposing magnetic fields helps to open the contacts faster by forcing them apart. The strength of the magnetic field is directly proportional to the amount of current. By reducing the time required to open circuit breaker contacts in the event of a fault condition, the blow-apart contact design results in less heat exposure over a shorter period of time. During normal operating conditions, the magnetic field in the blow-apart arrangement is not strong enough to force the contacts apart. I2T is greatly reduced since arc extinguishment in less than 4 milliseconds is common with blow-apart contacts. Straight-through vs. blow-apart contact design. Photo: Siemens.